We've been reviewing some new books on the market that should be in your personal or office library. These three recent publications reviewed here should help any reader develop new insight into the drug war. The experience and reflection of a thoughtful federal judge, the mission of a small desktop publisher and the investigations of an Oregon activist together form a complete package of knowledge for anyone wanting to know why things are so wrong with our courts, prisons and communities. Federal Judge James P. Gray has written Why Our Drug Laws Have Failed and What We Can Do About It - A Judicial Indictment on the War on Drugs, a 320-page volume available in paperback from Temple University Press, 1601 N. Broad Street, Philadelphia, PA 19122-6099. For online ordering email: kramer@mail.temple.edu or phone Gary Kramer at (215) 204-3440. The paperback edition sells for $19.95, the hardback for $59.50. 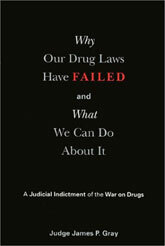 In his book Judge Gray calls for a complete discussion and change of direction in our country's drug policies. A former federal prosecutor and veteran Judge of the Superior Court in Orange County, California, Gray was also a criminal defense attorney in the Navy JAG Corps. He is one of few federal jurists who have spoken out publicly against the drug war, and he has logged more than 100 radio appearances, TV specials and drug forums nationwide. "Judge Gray's thorough and scholarly work, based as it is on his personal experience, should help considerably to improve our impossible drug laws. His book drives a stake through the heart of the failed War on Drugs and gives us options to hope for in the battles to come." "Gray effectively documents a growing coalition of often conservative lawyers, legislators and justices who view the drug war's impotent dream of national abstinence as folly and its shadow effects (from imprisonment of non-violent offenders to diversion of law enforcement resources) as dangers to liberty. Gray writes with the courage of his convictions, bluntly addressing the most controversial elements of the drug war. For example, he asserts that politicians offer slavish loyalty to the drug war because it's "fundable," not because it is winnable. Similarly, Gray details how drug prosecutions have both whittled away at constitutional protections and corrupted many police agencies. He even takes the radical step of humanizing drug users. Without assuming a libertarian stance, he establishes that the risks to an individual who is determined to use drugs are dwarfed by the harm caused to the community by overaggressive policing and the criminal economy. Gray's crisp prose is mercifully short on legalese, and his book has the structural clarity of an accessible legal text. This quality, and the sensible passion of Gray's conclusions, will make this a crucial reference for those politicians, voters, activists and law enforcement agencies seeking to reform established policy." Prisoners can certainly learn and gain something by reading Judge Gray's book, but in their situation more help is needed. After conviction and exhaustion of direct appeals, most prisoners from financial necessity must file their own post-conviction pleadings in court. Prisoners, especially those with very long sentences, must help themselves and work alone at this point, and now they can get some useful, legal assistance. In true self-help fashion, Maggie Medjuck, president of PSI Publishing Inc., says that she and her husband were motivated to write The Prisoner's Guide to Survival after a close family member lost his appeal and is serving 24 years for a non-violent drug offense under the mandatory minimum laws. "We have spent the last five years preparing the Guide for publication after experiencing years of frustration and disappointment in our dealings with the justice system. Our main goal was to write a legal assistance manual that was simple enough for the legal novice to understand, and yet comprehensive enough to be practical and useful," said Medjuck in a letter to the Razor Wire. This 745-page book can be purchased from PSI Publishing, Inc., 413-B 19th Street, #168, Lynden, WA 98264 in paperback at $49.95 for prisoners - $64.95 for free world buyers - plus $5 shipping and handling. Their toll-free telephone number is (800) 557-8868. With each book mailed to a prisoner, PSI Publishing encloses a cover letter inviting the reader to send any comments or opinions about the book to them so future editions can be improved. Medjuck says they have consistently received positive feedback about the ease of using it. Editor Paul Wright of Prison Legal News has endorsed this book in glowing terms. "Washington state currently plans to eliminate its prison law libraries, which means books like this one will be increasingly important to prisoners' assertion of our legal rights. I think it's a great book that will be extremely useful to prisoners," said Wright in his reviewing comments. I started Jim Redden's book, Snitch Culture: How Citizens are Turned into the Eyes and Ears of the State, thinking I would learn nothing new. That was wrong because this 235-page paperback is loaded with the history and details of our society's rush to tattle on each other. We know about snitches from the Bible, how Judas Iscariot betrayed Jesus Christ. Telling on one's family or friends has been with us a long time, Redden insists from the opening chapter. On the book's back cover it says, "Welcome to Snitch Culture, a surveillance society far more insidious and pervasive than anything George Orwell ever imagined. Elected officials from both political parties have spent decades building a vast domestic intelligence network to track every man, woman and child." This is a valuable piece of investigative reporting that when you're done reading it, you will easily understand why you can't trust anyone these days. Children turn their parents into the police on two-bit drug charges. Classmates tattle on one another to school officials. Friends rat each other out to the authorities. Political advocacy groups report suspected dissidents to the FBI. Employers hire undercover agents to spy on workers. Lawyers are forced to report clients who pay with cash to law enforcement agencies. Snitch Culture covers all of these issues and much more. I was particularly drawn to the reporting on the acclaimed Southern Poverty Law Center and its director, Morris Dees. It seems that Dees and his Center's proclaimed mission to watch and document racist, white organizations, such as the Aryan Nations in Idaho, also includes new work tracking the young anti-globalization youth seen prominently in the streets of Seattle in November 1999. Also, Redden's chapter on the bombing of the federal building in Oklahoma City has convinced me that this act of terror was a murky enterprise of government moles, assorted outlaws, gun runners and other disenchanted men like Timothy McVeigh. The details presented in this chapter give the reader credible evidence for massive government conspiracies that are definitely critical in creating our Snitch Culture. I highly recommend this book because of its lengthy reporting on drug war surveillance and its many snitches. One chapter discusses whistleblowers as special snitches. At the end, the book leaves you understanding its main premise: widespread, indiscriminate, opportunistic, and professional snitching has broken the back of many attempts at social movements and community solidarity. There can be no trust in this persistent climate of betrayal.